Hey hey! So I’m sharing a different, but super easy and tasty recipe today! 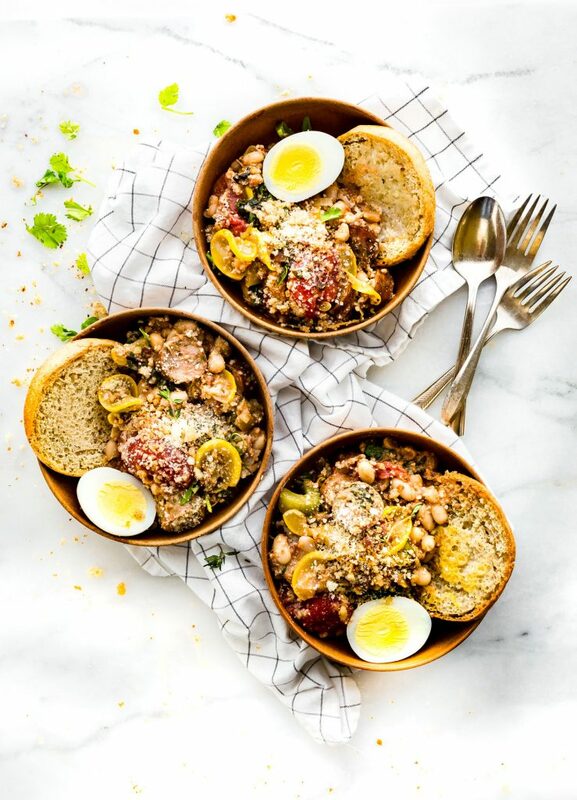 I’ve partnered with Udis Gluten Free new Gluten Free English Muffins to bring you this Quick Sausage Cassoulet Recipe with English Muffin Breadcrumbs! We are thankful for their wonderful Gluten free products and allowing me to continue to share and create gluten free recipes. Let’s keep the junk free thinking going this week. Mmm k? No stinking thinking, all good vibes and NOURISHMENT for that mind! Yes, that’s my idea of junk free June. As mentioned in my tropical snack bars post. Ya, the junk free food idea sure helps as well. It’s all about the mind body connection. Wouldn’t you agree? 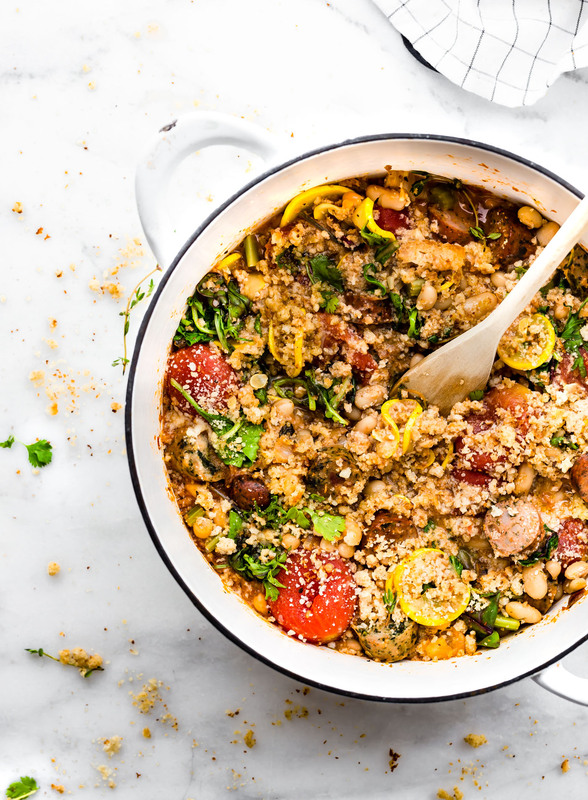 Which is why I am super stoked to share this gluten free cassoulet recipe with you today! Junk free for mind body soul. English muffin breadcrumbs being the secret KEY ingredient, shhhh. And of course, there is a story behind it! Here goes. Have you ever resigned yourself to not being able to do something, whether it be big or small?I know I’ve told myself this way too often. A thought pattern that is definitely worth throwing out. Hence the JUNK free thinking. That being said, French style recipes have always looked “too hard” for me. Daunting. Time consuming. But at the same time, I ADORE French food and miss the days of traveling the Southern France coast. Yes, first world problems. Anyway, today I decided to tackle that fear of French cooking and make it my own. I Cotter-ized a French recipe. Aka.. kinda sorta Americanized the traditional Cassoulet! Hold up, let me put my French Beret so I can feel somewhat authentic, then we can chat a little more about this French dish. Ohhh lala! You see, cassoulet is a rich, slow-cooked casserole, originating in the south of France. The dish is named after its traditional cooking vessel. Kinda like how us Americans named casserole creations after the casserole dish. Although I think cassoulet is more fun to say. Haha, Fancy schmancy. Anyway… this hearty, meat-veggie-bean dish from southwestern France is really the ultimate one-pot meal. It’s usually slow-simmered for a few hours, then baked to perfection with crusty french breadcrumbs atop. Are you swooning yet? Gah.. so so good. Here’s where I tackled my fears and make my own version. 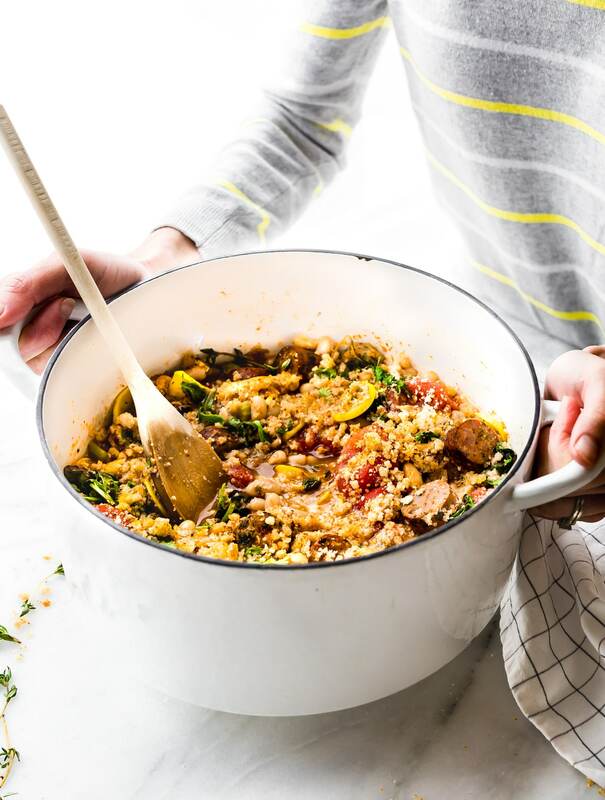 My quick sausage cassoulet recipe uses PRECOOKED gluten free chicken sausage, organic canned (BPA free) white beans, summer’s best stew veggies (love me some summer squash and kale), tomatoes, and wait for it…. 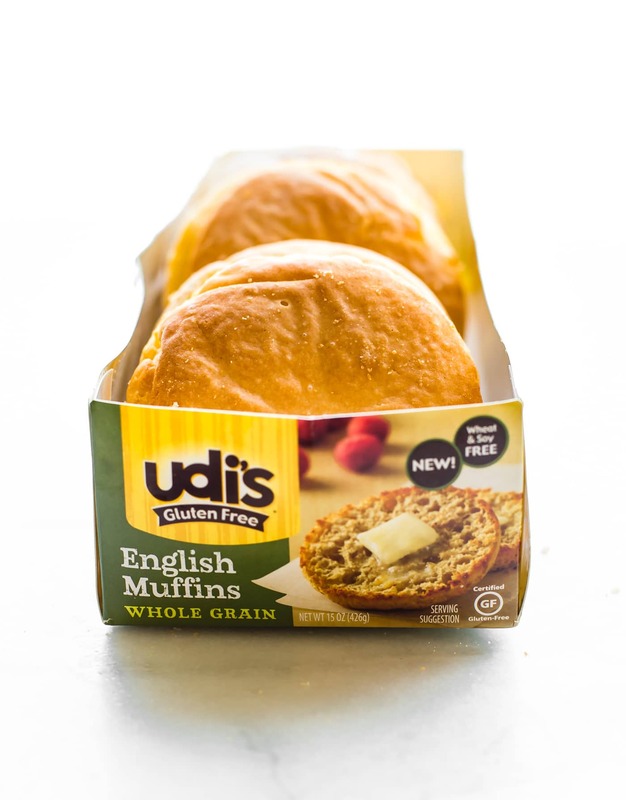 Udis NEW Gluten Free English muffins. Toasted with a hint of garlic and them crumbled on top. This sourdoughish garlicky crusty topping totally makes the dish!! Yes, I lightened up classic French dish. And I made it gluten free. And I made it in under an HOUR! Don’t tell Julia Child, Mmm k? Oh me oh my, these gluten free English muffins have been the latest obsession at our house. Whether it be for a breadcrumb topping or toasted with a smidgen of buttah. These Udis gluten free English Muffins taste nearly identical to the original, and are actually quite light. They toast up perfectly, ready to fill your stomach and warm your soul. BLISS! In this QUICK sausage cassoulet, I used Udis Gluten Free English muffins for both a topping and as an accompaniment to the dish. QUICK SAUSAGE CASSOULET WITH GLUTEN FREE ENGLISH MUFFIN BREADCRUMBS! Super easy one-pot meal! It’s great for meal prep, a hearty breakfast, or a wholesome dinner! 2 –3 Gluten Free English muffins (toasted) – We used Udis Gluten Free Whole Grain English Muffins. You will need Extra, sliced, to serve with the dish. 20–25 oz (around 2.5 cups to 3 cups) canned Cannellini white beans, drained. See notes for best brand. 2 Udis Gluten Free English muffins placed in food processor to make crumbs. Add Muffins to pan/dutch oven pot with 1 tsp oil or butter and 1 tsp Garlic powder. Toast in pot until browned (around 5 minutes). Add 1/2 cup chopped bacon and 8 oz of diced gluten free sausage or chicken sausage to your pan. Fry until cooked or if using pre-cooked, just cook until bacon is browned. Remove and leave a little bacon grease in pan. Add more oil to pot and then add onions, all yellow squash, onion, greens, celery, garlic, and salt/pepper to taste. Sauté until fragrant. Add your sausage, broth, drained beans, tomatoes, tomato sauce, and bring to a boil. Add thyme, 1 tsp dried oregano. Reduce and simmer 10 -20 minutes or until flavors combine and veggies are cooked. Taste and see if more seasoning is needed. Once the taste is to your liking, add your toasted English muffin breadcrumbs on top! Fresh Parsley to garnish. Optional parmesan to top! 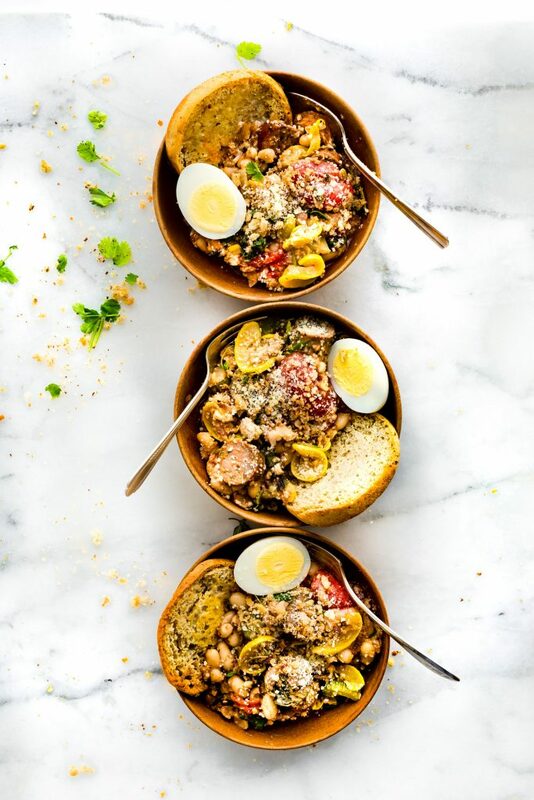 Spoon into bowls with half a toasted English muffin. OPTIONAL -> Add fried egg or whole hard boiled egg to each serving. Great source of choline and extra boost of protein. Keep in fridge for week or freeze for later. Store in air tight container. 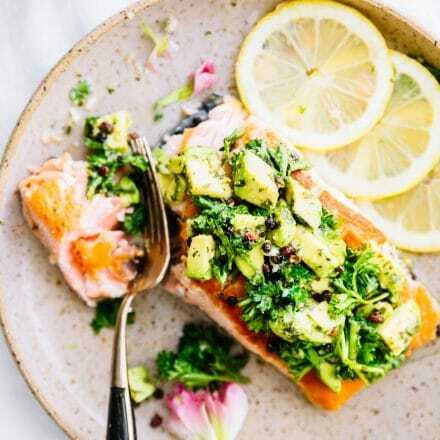 This make a great dish for summer or meal prep! Great with pre cooked chicken sausage or even vegetarian! 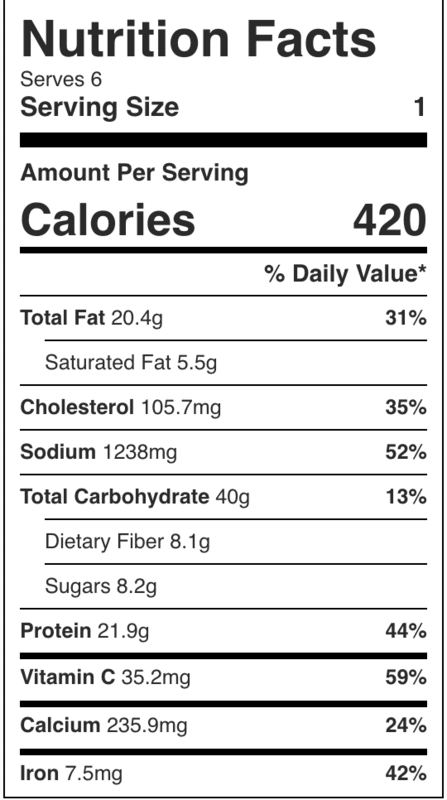 Nutrition varies depending on sausage being used. 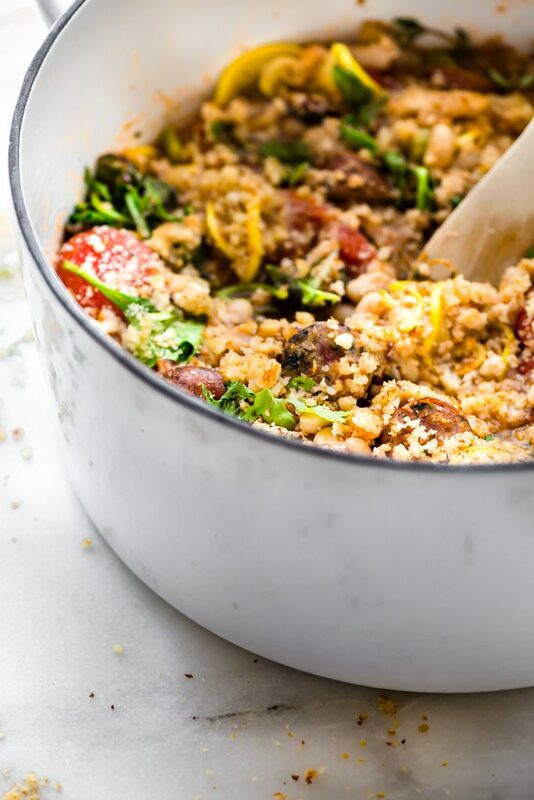 Ya’ll, this ONE POT dish is perfect for camping, breakfast, dinner, or even MEAL PREP! See.. one pot wonder made in a jiffy. 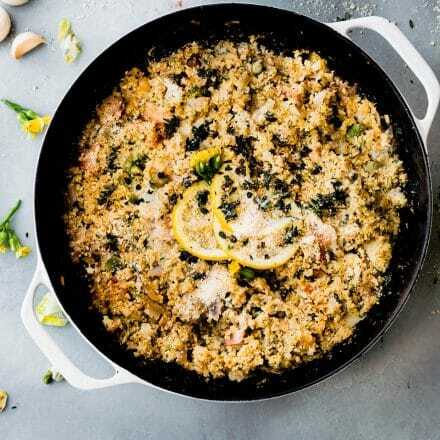 Ever tried Cassoulet? 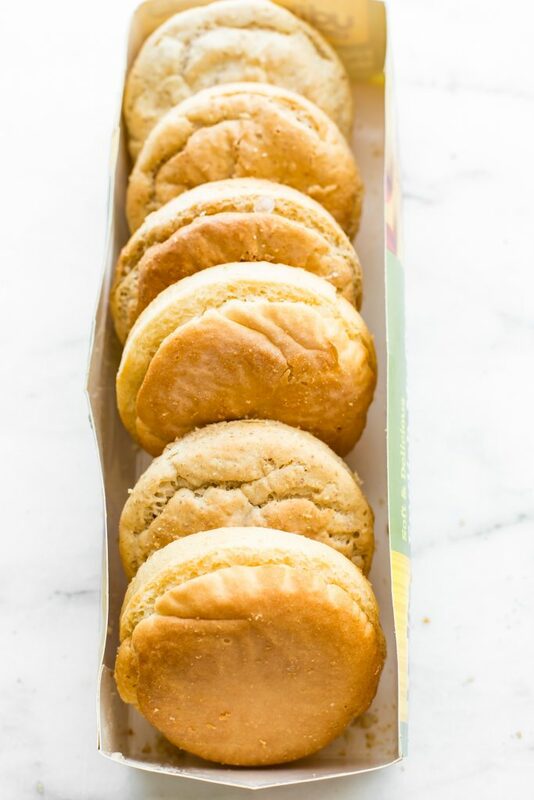 What’s your favorite was to eat English Muffins? Butter me up! Keep up with the compassionate fun loving Udi’s Gluten Free on social media. 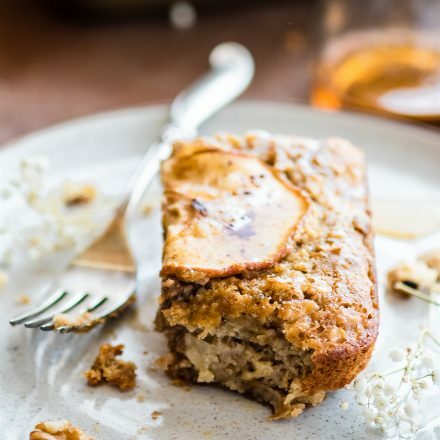 They are full of gluten free inspiration! Facebook , Twitter, Instagram, and Pinterest. This looks so beautiful, satisfying, and delicious! What a perfect comfort food meal! thanks Blair! Yes, so agree. Comfort food suitable for summer. YESSSSSSSS! We may have actually found a way to move to Europe in 2-3 years. I’m salivating already. For now, I’ll just have to make this to take me back. Yup! I’m joining you! Can I? I seriously need to make this! Looks like the perfect comfort food! I seriously need to make this! Looks like the perfect comfort food! Not to mention beautiful! This looks amazing! I love that you shaved a ton of time off the making process and using English muffin bread crumbs as a topping is so clever! Pinned! Thanks Tracy!! That topping is seriously my fav! Like sourdough crust! Yes I am swooning…what a delicious looking dish. Love the idea of using GF English muffins as a breadcrumb topper. 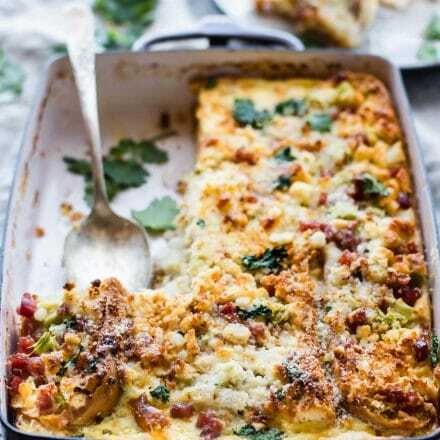 This dish is loaded with hearty deliciousness. Perfect for dinner. Adore that you lightened this classic! And yours is so much prettier with all those summer veggies. I feel the same way about making french food, if only there were more hours in the day! Summer veggies sure help with flavor! Don’t you agree? So many flavors in this dish! With all the veggies, I could probably do without adding any meat too. I thought about using tempeh isn’t if meat! Maybe next time! 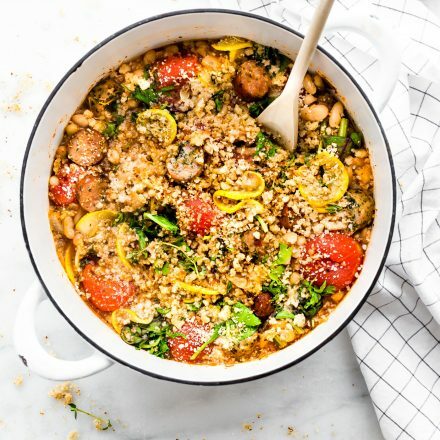 This cassoulet looks so delicious! Mmmm. Why is sausage in cassoulet so good? I never would have thought of putting English muffins on this dish! Great idea! Anything with quick in the title is good with me. I love how many veggies you have managed to pack in to this too. Using English muffins for a crumbed topping is genius! Only I probably wouldn’t want to grab the gross s’more flavored ones I let Sam get at the store yesterday that sound disgusting! Branching out and trying new things this would be perfect as I could always pick out the sausage and give it to Sam or the hubby and enjoy all the veggies! They have smore flavored?? lol which brand? I SO want to eat dinner at your house. You always have the most flavorful looking recipes. And they are so darn creative. Great recipe! And I’m excited to see these English muffins – I loved English muffin pizzas growing up and can now recreate them! great idea! i gotta try that next! Mmm PIZZA! This dish looks delicious! I haven’t tried Udi’s English Muffins yet, but I am a fan of their other specialty breads. I’ll have to look for them! Yuuuum! This looks AMAZE. And the english muffin breadcrubs? Genius! Gotta try this soon!